Earlier this week, a client wondered aloud which stage of the design process we like best. Some designers look forward to planning the layout (it's high on our list, too), others love hunting for accessories or homing in on just the right paint color. For us, it's the visit to the stone yard. There's something about walking amongst rows of massive slabs that's simultaneously both calming and invigorating. Their presence is so huge, their patterns so wonderfully unpredictable. To think these were once buried deep in the earth makes them feel almost like a living thing—how magical that you could share a home with something so wild. Needless to say, it's a lucky day when a job necessitates a trip to our local yards. 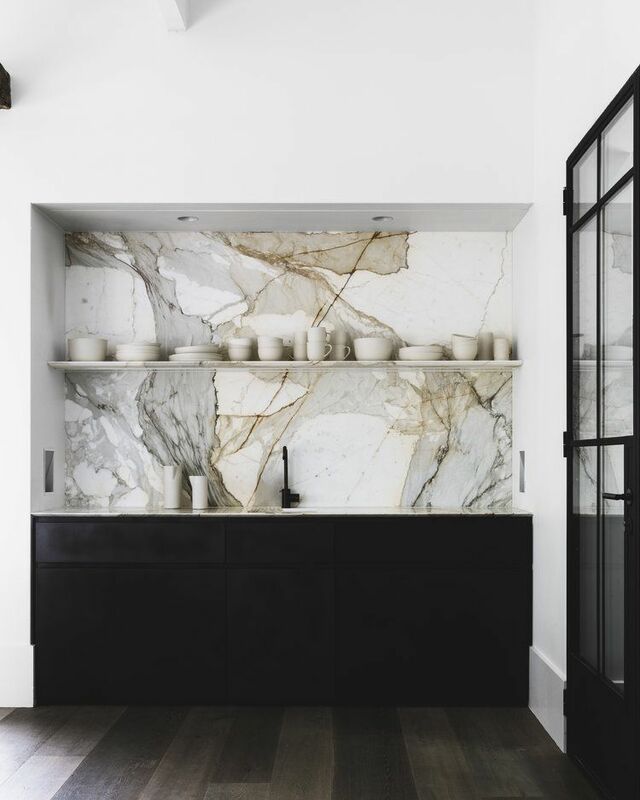 From marble to soapstone, honed granite to quartzite, there's no shortage of striking stones to pick from. If you're starting a search and feeling slightly overwhelmed, below is a quick primer of our favorites to help narrow it down. But first, will you look at how lovely these are?? Probably the most recognizable of the natural stones (looking at you Carrara and Statuary), marble is timeless in any setting. Pros include it's versatile appearance —hone it for a more rustic look, polish it for a classic finish— and it's comparitively affordable price tag for the more common types. The downside is it's porous surface, allowing it to etch and stain easily, especially with acidic materials like lemon juice or red wine. Not for the faint-hearted perfectionist, this is a stone most at home where the marks of a life well-lived are embraced. Available in a wide array of colors and patterns (some mimic marble in their soft veining), it can be polished, matte, or leathered for a textured feel. Once sealed, it's non-porous, meaning it won't stain or etch—and it won't be damaged by a hot pan. It gets points for being more affordable than some of the other contenders, but it's dated history (lest we forget the flecked beiges of every 90's real estate listing!) means you have to carefully choose a pattern that looks modern. Here's where it gets a little confusing. Quartz counters are technically man-made, or engineered. They're comprised of ground natural quartz held together with resins and polymers to create a hybrid, granite-like surface. The composition makes them extremely durable, stain/crack resistant (no need to seal them), and easy to clean. They're offered in an array of colors and patterns, and some come in a leathered or honed finish. 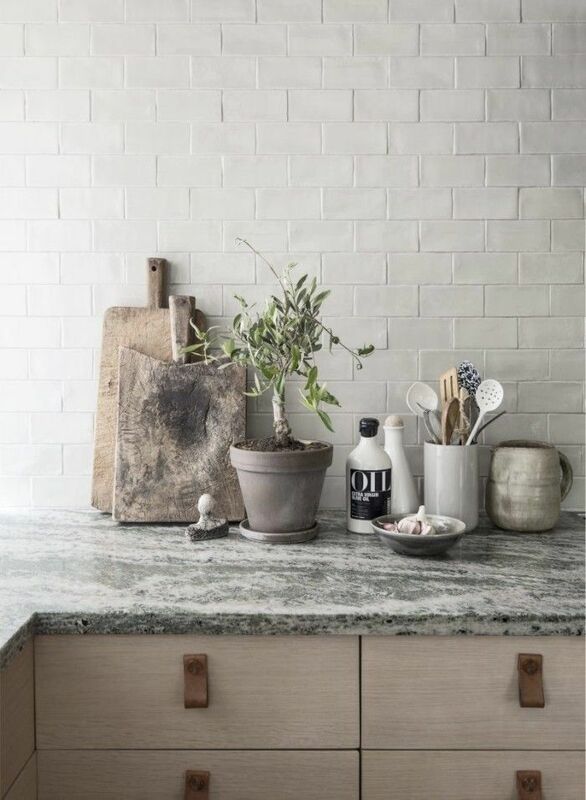 Wonderful for a rough and tumble kitchen (i.e. real life), their only major downside is the absence of all the gorgeous natural veining and color variations you get in a true natural stone. Strength and beauty are quartzite's claims to fame—it's denser and less porous than marble or granite and takes heat well. Plus, it's a natural stone, so the veining and variations are incredibly dramatic and downright lovely. It still needs to be sealed and resealed annually, and is often fairly expensive on the countertop spectrum. But—try to walk through a slab yard without falling head over heels for a quartzite...it's nearly impossible. No patience for maintenance? Then soapstone is for you. It's completely non-porous, so it won't stain and is unaffected by acidic foods and liquids or harsh cleaners. It also conducts heat, so it can withstand hot pans and trays without damage. It comes in a variety of grays to dark greens with some veining and though it doesn't need to be sealed, it does patina, or darken over time. If you prefer to speed up the process, adding mineral oil can achieve that charcoal coloring. It's talc content makes it soft to the touch, but also makes it susceptible to chipping, (though it's nothing a little sandpaper can't buff out). It's comparable to higher-end granites, but it's worth the price tag for never having to worry.